Pattern was re-edited on October 2011. The construction was improved and I also added schematics. 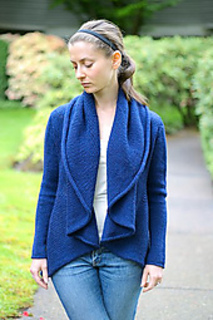 A very versatile and drapey cardigan, seamless, featuring a large collar, A-line shape and gathered cuffs. Shown in size 34/36 with no ease. 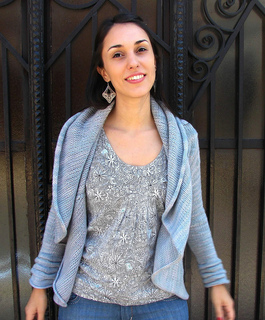 You REALLY need to use a yarn that can be blocked to make this cardigan. The circular piece of the body is built using short rows to form wedges that won’t look good unless you really block them out. So I strongly recommend you use a yarn that hasn’t got any acrylic in its content! This sweater is designed so that it will fit and suit your body even if the measurements are not “exact”. The only thing you need to pay attention to is to your shoulder span and the sleeve circumference. 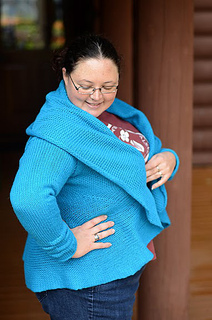 The rest of the sweater is just a circle and will adapt to your body shape, no matter if you have big or small hips, broad shoulders, or even if you are pregnant and showing a big belly!